I LOVE recovery week. I almost feel like a normal human being during this time. In addition to tapering my workouts, I try to use the time to catch-up on sleep, errands, and my dwindling social life. Monday: Went to Group Mobility in the morning which felt amazing, and then I chose not to workout that night. Mondays and Fridays are always my easiest days since Sat/Sun are such high volume. Wednesday: Skipped a workout and chose to sleep in, and then went to Group Strength at night…after I took home my new tri bike from Trek!! I feel like I’ve been living at Trek lately trying to square away my new bike purchase, but it was definitely worth it. I’ll have to blog about my experience another time. Friday: Glorious day of rest that included a romantic dinner with Jeremy at our new favorite spot by our place – Moonlight Lounge at Solace. A yummy/naughty salad. I’ve been obsessed w/ taking pics of my food lately. Saturday: Took my tri bike out for the first long ride. It was convenient timing since I didn’t have to rush into a 90 mile hilly ride like last weekend. The 65 mile bike ride up the coast and through Camp Pendleton was a good experience for me. I got to practice shifting and going aero a lot. It wasn’t as tough as I thought it would be, so I think I will be used to my bike in time for the Ironman! My bike ride was followed by a 2.5 mile run. I always try to run after my long bike rides. It’s good practice. Jeremy wasn’t feeling 100% that day, and we didn’t want to get drunk like the rest of the Cinco de Mayo participants, but we went out to a Mexican restaurant to enjoy the experience anyway. I got buzzed off 2 Mexican beers, and we watched the 21-year-old college students, the cougars, and the Mariachis go crazy! Our tame Cinco de Mayo. People watching is better than getting drunk off cheap tequila. Now it’s time for my final build sequence of Ironman training! I still can’t believe it’s almost here. AHHHHHHHHHHHH!!!!!!!!!!! Today is Tuesday, December 6, 2011, and today is the day my Ironman training officially begins! Over the next 7 months, I’m going to record my journey right here. My goal is to be able to track my progress and understand what works and what doesn’t work for me so I can become the best triathlete possible. How far can I push myself? How much sleep do I need? How many calories should I eat? How will I become an Ironman? I am really excited and nervous for the next 7 months! My life is definitely going to change in a big way. I’m so lucky that my boyfriend and two great friends will be going through this with me. We’ve affectionately named ourselves Team WODS! 6:15pm: Met up with my training buddy Nicole for an easy 6 mile run outdoors. I felt great and had no hip or back pain during the run, but my knees were a little sore. Below is a picture of the early Team WODS in June 2011: Jeremy, Asia, Nicole, and Mike (taking the picture). Three of us are raising our hands here to admit that it was our first triathlon ever! One year from that date, we will all call ourselves Ironman. Team WODS beginnings. Nervous first timers. June 2011. For those of you already thinking What the heck is an Ironman? click here to learn more about this 2.4 mile swim, 112 mile bike, 26.2 mile run triathlon event! The one I am officially signing up tomorrow for is Coeur d’Alene! 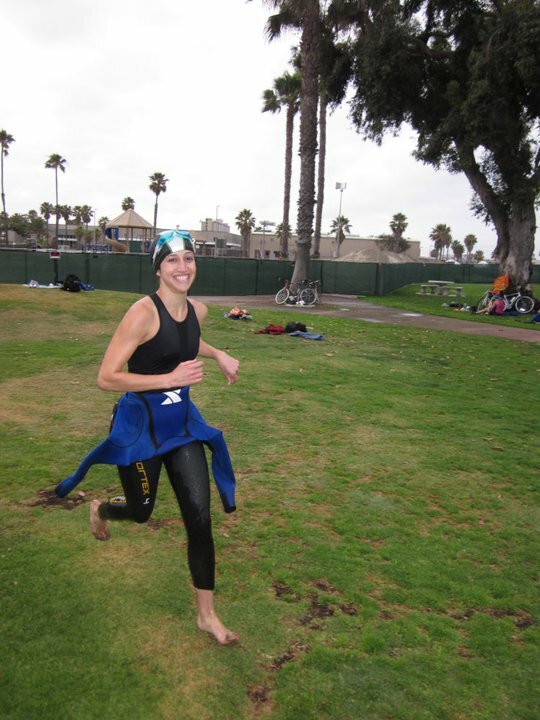 My half Ironman (aka a 70.3) will be a LOCAL race in Oceanside, CA! I’m so excited to have a plan in place! My first sprint is this Sunday (yes, my first one), my triathlon books are in the mail, and I am ready to seriously ramp up my training. This IS happening! All within 1 year! Am I crazy?? Four of us are working to complete this goal together: my amazing boyfriend, Jeremy, my great friend and blogger, Nicole, and her wonderful boyfriend (who has already completed 1 Ironman), Mike. We make a great team, and I look forward to this support system. I don’t know how I’d do it without them. I think I’d go crazy doing 4-6 hour training rides alone! Why would I want to subject myself to this? The answer is simple. I want to be an Ironman. I want to hear the announcer say “Asia Simonelli. You are an Ironman!” when I cross the finish line, hopefully with a big smile on my face.